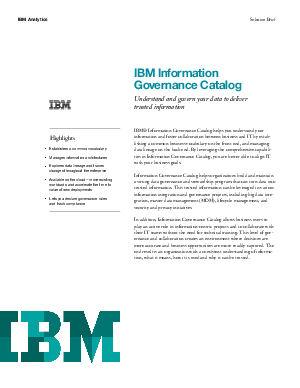 IBM® Information Governance Catalog helps you understand your information and foster collaboration between business and IT by establishing a common business vocabulary on the front end, and managing data lineage on the back end. By leveraging the comprehensive capabilities in Information Governance Catalog, you are better able to align IT with your business goals. Information Governance Catalog helps organizations build and maintain a strong data governance and stewardship program that can turn data into trusted information. This trusted information can be leveraged in various information integration and governance projects, including big data integration, master data management (MDM), lifecycle management, and security and privacy initiatives. In addition, Information Governance Catalog allows business users to play an active role in information-centric projects and to collaborate with their IT teams without the need for technical training. This level of governance and collaboration creates an environment where decisions are more accurate and business opportunities are more readily captured. The end result is an organization with a consistent understanding of information, what it means, how it is used and why it can be trusted.